Abstract: Pastoral care means building a friendship that accompanies people where they stand – focusing therefore on emotional support and spiritual care. We ‘are sent’ to the periphery to take upon ourselves the hostilities experienced by LGBTs choosing to defend, rather than judge them. 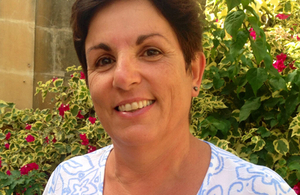 Joseanne Peregin (Malta, 53 years) is a Catholic mother of a gay son who, inspired by Sr. Jeannine Grammick’s visit in 2008, co-founded the support group for Catholic Parents of LGBTIs (Drachma Parents’ Group Malta). By combining her 35 years’ experience in Ignatian Spiritual Formation with her work-background in business administration and management, Joseanne co-ordinates the various pastoral and organisational functions of this family support group. She recently completed six years’ service as President of CLC Malta (a member of the World Christian Life Community). Uniting her family reality with her leadership role in the Church, she helps to build bridges of dialogue with local Bishops, religious institutions and ‘wounded’ families. She has helped with Margaret Farley’s visit in Malta and soon that of James Alison. She has become the first port of call for those struggling with the sexuality of their children. Her telephone number has become an unofficial national helpline for parents seeking to reconcile their faith with their child’s homosexuality. She often meets and accompanies ‘suffering’ families, helping them to strengthen relationships. She organises regular meetings, for their continued spiritual and human support. Joseanne’s desire is to see Christ’s Church embrace diversity as a gift from God, hoping the faith journey of many persons, may be further enriched. She reflects a more compassionate and less judicial Church. She is happily married to Joseph for nearly 30 years and they have two sons and a daughter.